page; the January 2009 newsletter will be posted shortly! This year our Heritage Days celebration will be very special! We have decided to accept an invitation to appear at the Bottling Works in Romney so that we can have access to a much larger crowd of visitors. Although the Visitor Center in Capon Bridge will be open that weekend, all of our efforts will be directed at the location in Romney across from the Deaf and Blind School. A lineup of interpretative presentations starting at 11 a.m in the morning with Ann Bailey, who represents the later Indian Wars in the western part of West Virginia. Although this is not a French and Indian War interpretation, we felt that it represents what living on the frontier during Indian raids was like for early settlers. We will also have Andrew Montour visit us. He was one of the most important and interesting Indian interpreters of the French and Indian War and a strong ally of the British colonials. He spoke six languages and was very knowledgeable about European customs. Another presentation will be given by Roger and Turtle Swartz speaking on a native American perspective on the war. We will also have a presentation on colonial clothing and a conversation with a Seneca warrior. Demonstrations of colonial crafts by our Artisans for Fort Edwards. You will be able to see how various items were made by colonial settlers; some craft items will be for sale. We will have a Connestoga wagon on display. Although this model is of a later period it represents how our colonial settlers often arrived in Hampshire County and how they transported their crops to market. The Maryland Regiment and various assorted scouts, traders and camp followers will be on hand to show you what life on the frontier and in the military units was like. Bring some money, because the Musuem Shop will have a wonderful collection of books on colonial history and the French and Indian War and some other items for sale. Stock up for Christmas or just for yourself! Our project to build a partial reproduction of the stockade at Joseph Edwards's home during the French and Indian War has been slow and plagued by many problems. We would like to report that progress is being made. However, it is rather hard to find people who are stockade builders. If you would like to volunteer for this exciting, worthwhile, outdoor activity, please call Charles Hall at (304)496-7218 or contact Mark Jones by email. 1757 was a time of Indian attacks on the colonial frontier. After Braddock's disastrous defeat in July, 1755, the French and their Indian allies attacked the settlers almost without opposition. In Virginia Col. Washington was struggling to build the Virginia Regiment to a respectable and effective fighting force, but the frontier was long and his force small. This year's Colonial Feast featured a History Symposium with three presentations on Native American subjects. We were very pleased to have Brian Reedy of Fort Necessity, Steve Robertson of Fort Frederick and Roger and "Turtle" Swartz speak on various aspects of native American involvement in the war. It was the first time we have been able to dedicate a major presentation to the third party of this three-way war for North America. June 23, Saturday, 10 a.m. to 4 p.m. 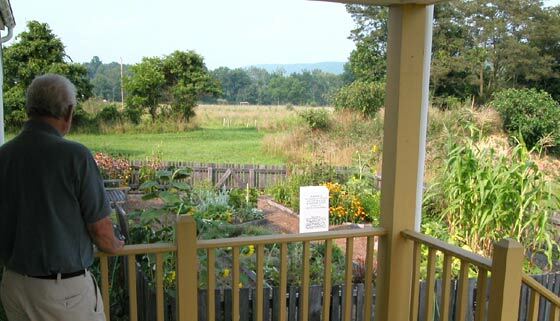 Please contact Julie Flanagan (856-3866) to volunteer for the Kitchen Garden. We need help with spring planting, summer maintenance and fall harvesting. We also would like to prepare some school programs on the garden and colonial life. However, without more volunteers that will not happen. We need your help. Thanks. Don't forget to send in your dues for 2007! !